Instructions are for 40” x 50” quilt or 60” x 75” quilt in both Positive and Negative settings! 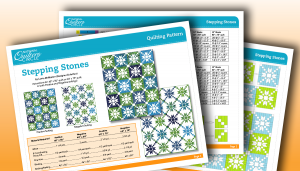 These quilts are made using 10″ or 15″ Stepping Stones blocks. This fresh pattern provides a detailed guide to each aspect in the construction of this handmade quilt. It is a simple pattern and would be easy for even the most novice quilter to make. An accurate 1/4″ seam is recommended.